* First person to comment on any post title ending with a star will be featured here as my 1st commentator! uwaaa! i'm falling out of top 5! but i see that i still in the top 10! LOL! you're on a roll!!! Wah! I'm dropping..gonna have to leave more comments! What a wonderful way to reward your visitors and commenters!! I just got back .. long day outside and now I am bushed!! so probably will retire and start early 2mrw! I don't think I made the list to your other blog, but I'm so glad I made the list here! :D Yay for me! :D lol! Good morning GP... what a fun new feature. I'll have to work harder to be top dog one week. 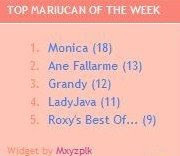 congrats to monica and other top commentators. I'm going to put up a TC widget again. You're using two different TC widgets? Hi there! Wow left so many comments at my blog - want to be the undisputed top commentator is it? Haha! I love MPG.. I love GP.. I love Benji..
Watch out Monica.. gonna dethrone you soon!!! I wonder if they only pick up first level comments and not the threaded ones!! Yiha.. have you tried replying from your emai.. super awesome!!! hahahha.. lets all switch.. lol!! LJ! Dah update and it links back to my TC widget yeeha! Check out setup again.. and I'm assuming you have the "Send replies to email" activated right? I noticed that.. and so I am now checking into it!!! You should.. you should.. i standby...lol!! yeah.. maybe new account kot! Lemme know if ur widget links back to commenters later. Should be okay i think. I'm sure they are adding more features dearie! I'm sure it would come in soon dearie..
eh try embed video.. I've not tried it yet...lol!! 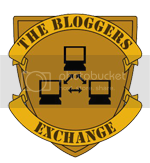 LJ, u should check out MXY's blog link at my post here, that will take u to all 3 widgets so u can choose. Apparently got monthly TC widget oso, which means it resets to 0 every month...BUT i tried it out and it only links back to 5 commenters. So I didn take that one, but i think it resets. Anyway I will email u the code. hang on. GP! thanks for code.. but it links back to the comments lah not the url..
Ooooops spoke too soon, Kim is off the list now poor thing! Yeah I know.. I was about to say the same thing.. mine is linking to the comments..hehe..
ok.. let me go check :).. thanks dearie! Ok then let me know yeah? I got ur other comment on u noticing ur name linking back to comments, but I cant seem to find it here! Checking out comment luv now dearie! don't mind.. as long as tally the total comments...lol!! OKies! I noticed kat Matt's blog oso same thing, some links back to comments hmmmm...anyway testing my comment luv now! Ok.. be there soon to test it as well.. then I can go to sleep! Testing for commentluv.. testing testing..
Nite nite GP... my eyes cannot open already.. sleepy...:(.. nite nite! lol looks like you have stepped up the competition girl, and will have your normal 10 fighting for the top 5 now haha! 8-) =-O Cant stop right? Some more so fast the comment appear eh? Wah new picture Mon.. I like.. love you hair!! Recent blog post: Lisa Marie Presley’s Twin Baby Girls and Name for Jennifer Garner Baby! Correct GP!! You can't.. Yeay you got commentluv working.. awesome kan to drive traffic to your blogs.. look at me.. keep changing my url..lol!! See?? the top is Jennifer Got A Girl and Alyssa Got A Man.. for this one... i will choose..
Yihaa GP!! betul tu.. very fast. not like blogger!!! ahahha.. yes.. very the LaJu!! lol! hmm.. try commenting on my blog and see if you get anything GP! nevermind.. they are working on their own top 10 now.. so yihaa!! LJ!!! Testing reply from email now he he!! I see it!!!! so dah boleh lah!! Sure thing, emmmmm lemme see how to do that. Go to blogger dashboard eh? Yeah.. under comments i think! Sure.. i see it and now I see it at your blog as well.. best and easy kan.. speed is no probs now..lol! Ok I removed my email add, lets see if it works! It works! But now all comments remain unknown until u click on the msg to see who’s it from he he…. Give and take la I guess. Can’t win them all yes? So u gonna remove ur blogger comment notifikasi ke leave it be?? If it works.. yeap.. I will... heheh.. thanks for testing it dearie! It works woman! No more notifications from blogger now, just JS! So happy I can reply by email now, mmg so much easier eh? Thats why lahh.. only sometimes jer blur esp when someone just smile..lol! Ha! I´m on the top 10! Also, thanks for advertising on my food blog! That show must be cool, many bloggers mention it. It doesn´t pass here, not even on cable TV. Booyah!! I can't believe I made the list. Recent blog post: Too Much Testosterone? Not exactly sure what to make of this new commenting system. It's like yours...huh LJ? Congrats to Monica!! And yay you for the roll you are on, girlie! !